To meet all areas of our brief we are assessed on the ways we work as a team alongside how professional we are at going about this. Professionalism comes up in many areas we have covered such as group critique where to be professional you will sit and listen when a student is presenting there work and once they have finished give constructive feedback or critisism in relation to the work they have shown. That being one example this blog post addresses the way we communicate as a group to bring the project together. Facebook– The popular social networking site has all of the students on and using on a regular basis via pc, phone and tablets. It provides a quick and easy form of contact to fellow students regarding work or as previous cases have been absence to the sessions. In facebook we have 2 groups, one being our own private group where we have been posting tutorials, information and news regarding our work. Then the other is a page open to the public where we post our videos and news to keep them all interested in the project this is more of a asset of getting our word out but still communicates to the public for potential feedback. These are some quick screen captures of what i am talking about. 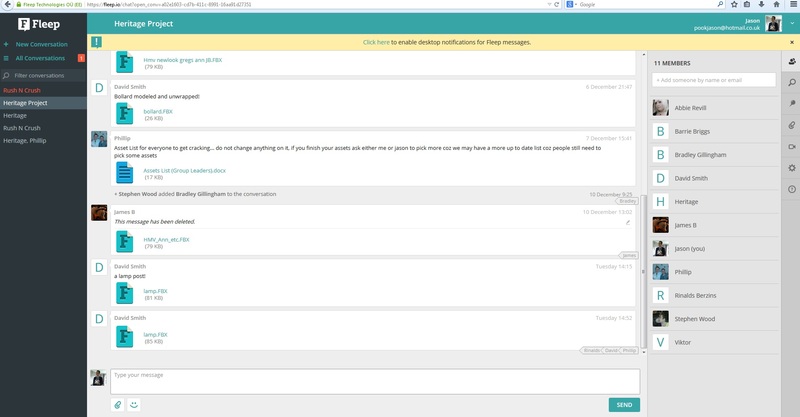 Fleep– This is a way for teams or businesses to chat aswell as send files to eachother through a conversation. This is the main program we have been using to upload files to go into the project so far alongside facebook being the most used for help and feedback. Fleep allows us to simply type a message to the group who are all added in the chat through email (sends notifications through email when a message is sent) or upload a file which the group can individually download. Its rather casual means of communication isnt much structure other than chat and upload. 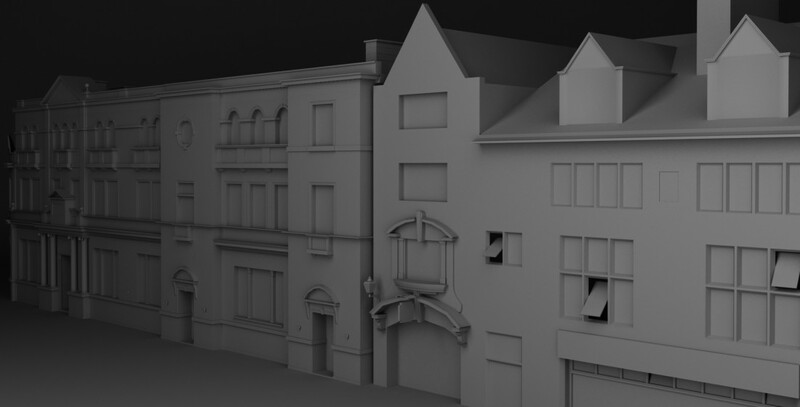 This has been the general go to for give us your buildings to go into the project over fleep rather than handing in through hard drive. Youtube– Our primary video uploading website where updates for the project have been videoed and uploaded for all of us to embed on our blogs and also post to other social networking sites to show the outside world our work. The link is to our page which currently has 2 videos of the client project process filmed by Me and Phil. This is there for anyone to use for personal video clips on their contributions if they feel they want a in depth analysis of there work explain through visual rather than a blog. BaseCamp– As the provided and assessed program we have been given Basecamp, a professional business management software which we need to start using to show our professionalism. In Basecamp you can send a message, make a “to-do list”, add an event, and upload files. The use of the To-do list gives us a visual calender to set deadlines for the group, people can tick off that they have met this if finished. We also can monitor the use of the program as there is a “last logged in” section on the page, so people who havent been checking basecamp maybe missing work or deadlines if they say they forgot we can reinforce its on basecamp and you should be checking it regulary. Here is some visuals of the layout, it clearly looks the more professional and with a limited space for uploads this will be needed for final models and the project not just endless building updates. We can use the other methods to support that and as long as we evidence it then it counts as management of the client project. As one fo the leaders in the group I will have to take a forward role in enforcing people to use these programs especially Basecamp so that work is done collaboratively and effectively, But have setting up all the online presence myself they all know its there and have passwords if they need to log in to them for personal use. We also have a hotmail and a twitter but are yet to use them so i havent included them in the primary methods. To summarise this we use Facebook as a means for quick contact, tutorials, quick feedback and pooling resources from alternate online areas (youtube etc). Fleep is our quick and easy uploading weekly or after group critique hand ins of work to update the client project consistently. Youtube is basically a way to upload our process update videos so that we can show the public and embed videos into our blogs. Finally Basecamp is our main software piece assessed on our group management and professionalism which we will use for deadlines and files. Categories: Client Project, Year 2 | Tags: 1960s, BaseCamp, Client, Communication, Facebook, feedback, Fleep, Management, Professionalism, Project, youtube | Permalink.